Pittsboro, NC – Living in Chatham County, right next door to Jordan Lake, is heaven to a nature lover like me. The lake offers just about everything an outdoorsy person could want, including amazing opportunities to bird watch. An outstanding birding location year-round, Jordan Lake seems to attract more stellar rarities, such as Long-billed Murrelet, White-tailed Tropicbird, and Smith’s Longspur, than any other local spot. And did you know that Jordan Lake supports the largest concentration of bald eagles in the eastern United States? Jordan Lake State Recreation Area comprises 9 recreation areas on 46,768 acres surrounding a 14,000-acre man-made lake. Vast, undisturbed areas provide the perfect home for the bald eagle; there’s plenty of fish to eat and a mature forest for roosting. Although protection efforts have increased the numbers of this mighty bird, it still remains a rare species. Fortunately, the population of eagles in the Jordan Lake area has increased dramatically since the flooding of the reservoir in 1983. Though bald eagles are active throughout the daylight hours, the chances of observing an eagle are best during the early morning hours or late in the day. 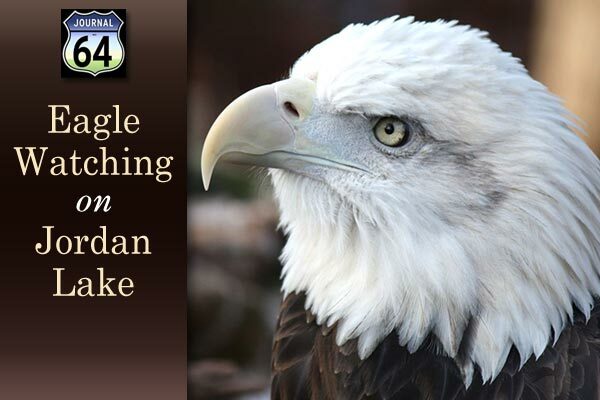 The best time of year for observing eagles around Jordan Lake is during the spring migration, generally April, May and June. Beginning as early as January, however, you might begin to catch sightings of early returns and nest building. Areas that offer a wide view of the lake are your best choices. These would include Vista Point, Ebenezer and Seaforth recreation areas. The eagles congregate at the north end of the lake and can often be seen from either the NC 751 bridge crossing Northeast Creek or the Wildlife Resources Commission’s Wildlife Observation Deck. The observation deck is located five miles south of I-40 on NC 751, 6.5 miles north of US 64. From Durham, take I-40W to the NC 751 exit. Turn left onto NC 751. After you cross a small section of the lake, go less than a mile and turn right into a gravel drive to the parking lot. Shhhh! Don’t tell anyone. There is an area near my house on Hwy 64, just east of very first body of water to left, that the big boats can’t go, so it’s very peaceful. I go out on my kayak with the kids from that spot. It’s off Hwy 64 and in Parkers Creek recreation camp ground. There is also, bird watching telescopes at the Dam along with hiking trails and a park and I think there is a small museum or store there too. Canoe and kayak company offers guided tours and Haw River Assembly has a ton of info as well. Interpretive programs about the bald eagle are conducted throughout the year at Jordan Lake, usually during warm-weather months. For information on the educational programs available, visit NC Parks. Finally, if you can’t make it out to the lake, you can still see what’s going on. At least, inside the nest. A group of NCSU students, with the help of faculty and friends, have hooked up an Eagle Cam video stream. You can watch on the internet and even help gather scientific info about eagles. Call, write or visit if you have any questions about livin’ in Chatham County, NC.